The University of Innsbruck submitted the project proposal named “Entwicklung innovativer Konzepte zur hydraulischen Offshore Energiespeicherung mittels schwimmender Reservoirs (development of innovative concepts for hydraulic offshore energy storage by means of floating reservoirs)”. 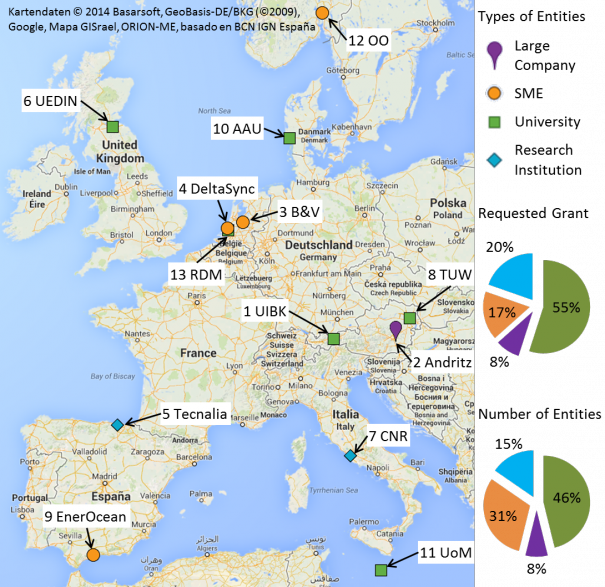 Research program: 2nd call of the Austrian research and technology program Energieforschungsprogramm 2015 funded by the Austrian Climate- and Energy Fund and promoted by the Austrian Research Promotion Agency. Research funding and financing instrument: exploratory project (preliminary study) to prepare a future research, development and innovation project (R&D&I) and to investigate its usefulness. 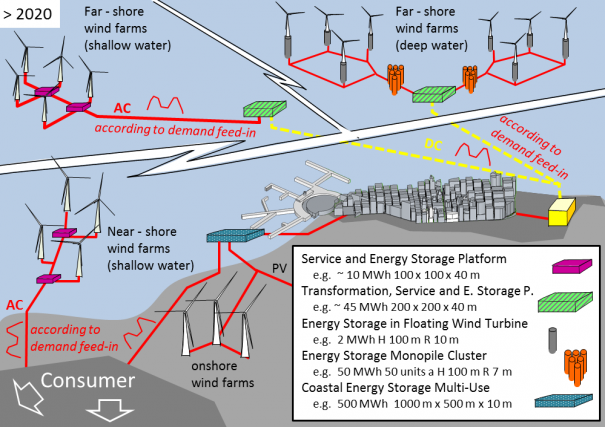 The concept Buoyant Energy (BE) – a kind of floating pumped storage power plant – has been developed by researchers at the UIBK (patent pending) and offers the possibility to store electrical energy directly on the water for example, close to offshore wind parks. This can be an important contribution to the decentralized balancing of electricity supply and demand. On top the more volatile, renewable energy can be integrated. The basic concept is simple and scalable, but the practical realization of the power storage system yet requires extensive development work. These include determining the optimum areas of use and fields of application, floating body design, investigation of technical equipment and machinery, and identification of possible combinations of BE with floating infrastructure. 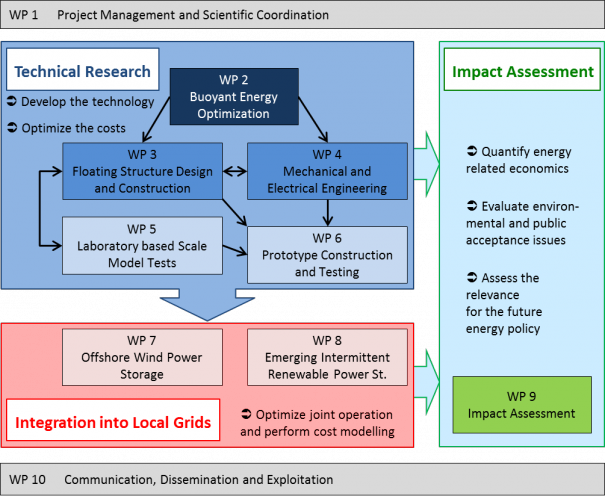 The aim of the exploratory project/scoping study is to show that the BE concept is technically feasible and economically viable for the future in principle, to identify ways to best chances of success, thus winning industrial partner for the expansion of green storage know-how into prospective regenerative dominated power grids. The University of Innsbruck submitted together with the TU Vienna and the University of Edinburgh as subcontractor the project proposal named “Entwicklung innovativer Konzepte zur hydraulischen Offshore Energiespeicherung mittels schwimmender Reservoirs (development of innovative concepts for hydraulic offshore energy storage by means of floating reservoirs)” in the 1st call of the research and technology program Energieforschungsprogramm 2014 funded by the Austrian Climate- and Energy Fund and promoted by the Austrian Research Promotion Agency. 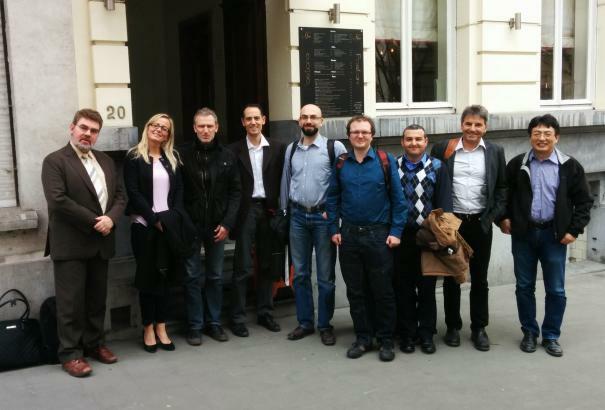 In line with the work programme the project aims to develop a novel, very effective, highly available, very durable, sustainable and safe solution for distributed energy storage. Buoyant Energy is an offshore concept, which is based on the pumped hydro storage power technology. This technology will be transferred from mountainous regions to the sea. The solution offers outstanding advantages compared to other emerging energy storage technologies. Those characteristics are very much linked to pumped hydro storage power systems. In contrast to those plants with an upper and a lower reservoir “Buoyant Energy” uses a smaller reservoir (buoyant platform) located within a larger reservoir (the sea). Due to the mass of the floating structure there is a water level difference. Water is moved from one reservoir to the other by means of pumps and turbines: to store energy, water from the smaller reservoir is pumped into the larger reservoir (the platform raises); to release energy, the structure is lowered and the inflow into the smaller reservoir powers a turbine. On top there are important synergies with other offshore activities to expect (e.g. facilitating the access and the operation for offshore wind farms). Buoyant Energy owns the potential to contribute significantly to the cost-efficient integration of distributed and variable renewable energy sources. The lifetime of the floating platforms is expected to be much longer than 50 years. There is no reduction of the efficiency over time or any harmful environmental impact to expect. Anyhow, the energy density is relatively low and a lot of construction works are required. The challenges of the technology are the technical adaption system to the offshore conditions and a straight cost optimization mainly by adapting suitable construction methods and pump/turbine systems. 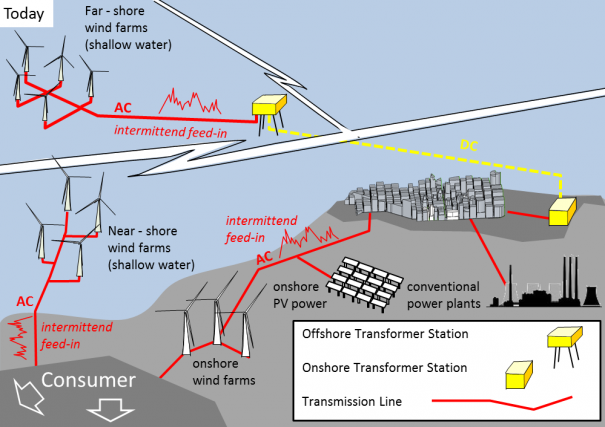 Potentially Buoyant Energy could turn out to become the Break-Through-Technology in renewable offshore energy integration. The University of Innsbruck together with the TU Vienna submitted a proposal for funding a research project named “Entwicklung innovativer Konzepte zur hydraulischen Offshore Energiespeicherung mittels schwimmender Fluidreservoirs (development of innovative concepts for hydraulic offshore energy storage by means of floating fluid reservoirs)” in the 2nd call of the research and technology program e!MISSION.at – Energy Mission Austria funded by the Austrian Climate- and Energy Fund and promoted by the Austrian Research Promotion Agency. Participation in the International WIND Matchmaking Event in course of the EWEA 2013 Annual Event at Vienna (Europe’s premier wind energy industrial event comprising an extensive exhibition and comprehensive conference). Buoyant Energy is presented to and discussed with 14 organisations from 6 countries.